If there's one thing you ought to know about me it's that I'm one of the most indecisive people you'll ever meet. It takes me at least 10 minutes to pick out the perfect tube of toothpaste at the grocery store (after checking Amazon to see if there's toothpaste for a cheaper price, of course). Hey, we've all done it! No matter how big or how small the purchase, I'm a world-class researcher. Needless to say, it's less than productive. And then there's buyer's remorse. You would think after all the time I spend researching and choosing an item that I would be 100% satisfied. Nope! Like everyone else, many times I make a poor decision. As Charlie Munger always said, "smart people do dumb things." So recently I set out to try and learn how to make better decisions. 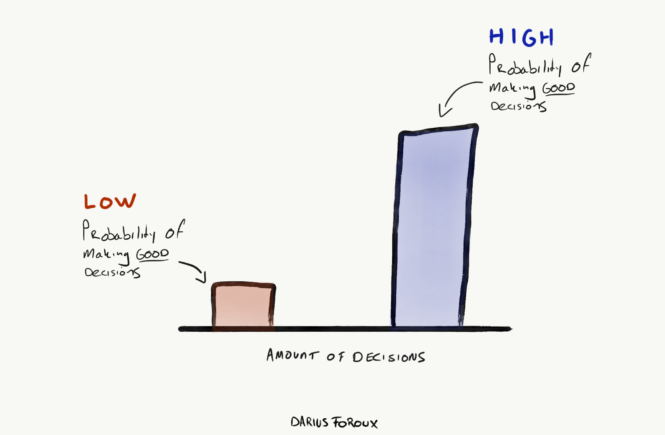 That's when I came across a great article from Darius Foroux titled, "Want to Make Better Decisions? Do This." We're all striving for perfection - or some form of it. Naturally, we think many of the decisions we make are life or death or will change our lives forever. The truth is that we're more resilient than we think and we can often bounce back from even our worst decisions in life. A recent study showed that we make more than 70 decisions per day. If we think about it from that perspective, we're all trained decision makers by nature. But if you put off making small decisions over time, those decisions end up becoming big ones (and big hassles). Like the decision, or not, to go to the doctor for a checkup. Word for word, this couldn't be more true. In the world of product building, for example, founders who seek out crucial feedback from real users early and often have a much higher chance to succeed than those that build a product in a silo. Early decisions lead to quicker learnings, which leads faster growth and success in whatever you are pursuing. You've probably already made 15 decisions today by the time you're reading this newsletter. What will you do with the other 55?